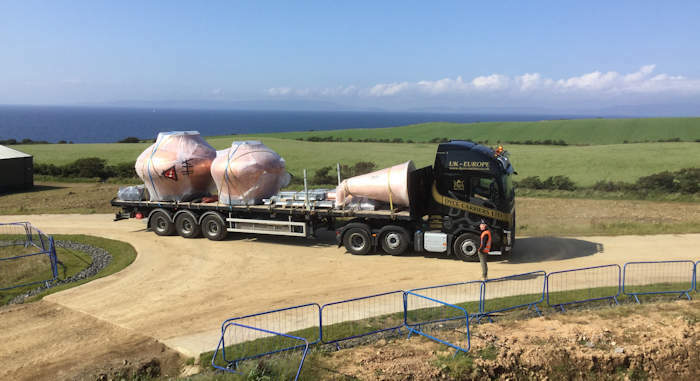 Isle of Arran Distillers Ltd have edged closer to the completion of their new Lagg Distillery, having recently welcomed the arrival of their new custom-made copper pot stills to the island. Following their departure from Rothes on the east coast of Scotland, the stills made the ferry journey from Ardrossan to Brodick on Thursday 30th August, before travelling down to the Lagg Distillery site early the following morning. Master Distiller James MacTaggart, along with Graham Omand, the newly appointed Lagg Distillery Manager, and Faye Waterlow, the Lagg Visitor Centre Manager, were on site to welcome the copper pot stills to their new home, where they will begin the production of the signature Lagg Single Malt in early 2019. The copper pot stills were manufactured by renowned still-maker, Forsyths. They have been specifically tailored to create a heavily-peated (50ppm) earthy spirit that will become the flagship Lagg Single Malt. It is expected that this spirit, despite being very different in nature, will retain many of the characteristics that are the staple flavours of the celebrated Arran Malt. The wash still has a capacity of 10,000 litres and the spirit still a capacity of 7,000 litres. The new Lagg stills will allow for a production level within the first year of 200,000 litres of alcohol. Speaking about the arrival of the stills, James MacTaggart said: “The copper pot stills will now be installed into their new home and complete a commissioning phase. The anticipation of waiting for them and then watching them arrive has created a great buzz on the site and on the island. As well as the arrival of the stills, the three warehouses on site at the Lagg Distillery have been completed and the keys have officially been handed over from the construction team to Isle of Arran Distillers. This allows the team based at Lagg to start preparations to store the casks that will be filled at the new distillery. When fully operational in 2019 the Lagg Distillery will increase Isle of Arran Distillers production capacity to 2 million litres. Furthermore, the total visitor numbers to both distillery sites is expected to exceed 200,000 by 2020.